Kevin Winter/Getty Images via ABC; ABC/Ida Mae AstuteMadonna, Celine Dion and Barbra Streisand have landed on Forbes magazine’s list of America’s Richest Self-Made Women. Madonna comes in at #26, making her America’s wealthiest female musician. Forbes puts her estimated net worth at $590 million. Dion ranks at #46 with an estimated net worth of $430 million. Despite Celine being Canadian by birth, Forbes cites that most of her money has been made within the U.S.
Streisand is tied at #48 with “Judge Judy” Sheindlin, with an estimated net worth of about $400 million, thanks in large part to her successful tours and recording career. Other female music artists on the tally include Beyonce at #53 and Taylor Swift at #60. So who’s #1 on the tally? Hint: She’s rich, but not famous. Diane Hendricks, the co-founder and chairman of ABC Supply, one of the largest wholesale distributors of roofing, siding, and windows in America, tops list. She’s worth an estimated $4.9 billion. 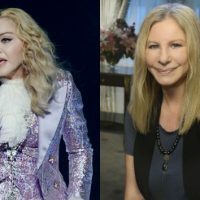 Madonna, Celine Dion and Barbra Streisand have landed on Forbes magazine’s list of America’s Richest Self-Made Women.